[Image: "C-47 Alberta" by Richard Mosse]. Photographer Richard Mosse, originally from Ireland, is a graduate of the Yale MFA program in photography, as well as a recipient of a Leonore Annenberg Fellowship in the Performing and Visual Arts. This Fellowship has funded Mosse's ongoing and extraordinary series of travels around the world. 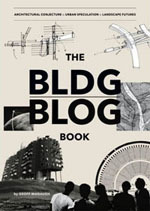 Readers of BLDGBLOG will recognize his work from its previous appearances here—whether that's the air disaster simulations of a year or two back or the full interview with Mosse about his, until then, unpublished photographs of Saddam Hussein's palaces. Having worked together all Autumn as part of the quarantine studio here in New York, Mosse and I coordinated another interview, via email, about his most recent solo exhibition. 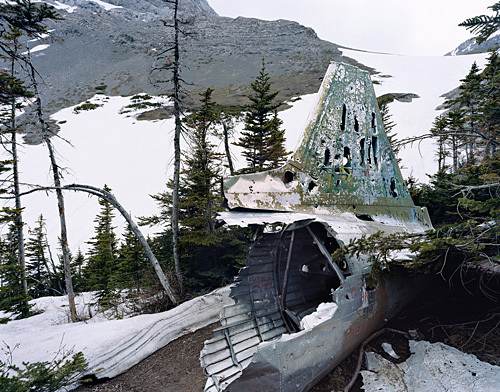 That show, called The Fall, features photographs of extremely remote airplane crash sites, with often partially dismantled or disintegrated wrecks disappearing into an uninhabited landscape; Mosse compares these structures to the Arctic shipwrecks and ruined forest abbeys of painter Caspar David Friedrich. The images will be on display for only two more days—closing Wednesday, 23 December 2009—at New York's Jack Shainman Gallery. 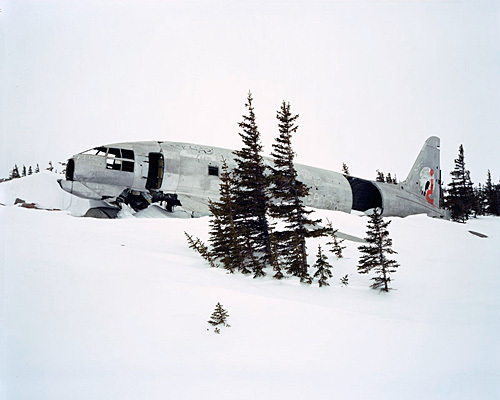 [Image: "C-47 Yukon" by Richard Mosse]. 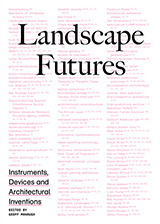 In the following interview, Richard Mosse discusses the visual representation of catastrophe; conceptual links between terrorism, advertising, and photography; the 2006 disappearance of pilot Steve Fossett; surveillance subcultures along the U.S./Mexico border; the short fiction of J.G. Ballard; and Werner Herzog's film Fata Morgana. BLDGBLOG: I'd like to start off with a fairly practical question: how do you actually locate these plane wrecks, many of which received no media coverage at all? Mosse: These photos are the result of months of online research, skimming forums, YouTube videos, Google Earth, Flickr, emailing wreck chasers, and cold-calling bush pilots. I'd even surf the web for jpegs of plane wrecks, then bring this information into Google Earth in the hopes of finding tiny silhouettes of downed planes. I was searching for accidents so disintegrated and remote to civilization that they only really exist in the virtual imagination of transient and anonymous online communities. Others had become landmarks, a destination for the intrepid to come and leave their trace. Like 19th-century survey photography, it became a process of charting the unknown—but it's also a kind of picaresque quest narrative. I think the work has echoes of the poète maudit, the immoral artist figure who will go to any extreme, transgressing any boundaries in pursuit of the ultimate aesthetic experience. [Image: "C-47 Crows Nest Pass" by Richard Mosse]. BLDGBLOG: Abstractly speaking, was it that idea of trespassing and transgression—photographing something that terrifies so many people and that so few people actually witness or see—that drew you to this project? Richard Mosse: I’m fascinated by contemporary art’s ability to point to the limits of experience, making visible what can't otherwise be represented. Photography, meanwhile, is supposed to be rooted in the world of things, as it carries an actual physical memory of the world at a specific time and place. Between these poles, I think photography has a unique potential to represent human suffering—which is, after all, something that cannot be represented. I cannot literally feel your pain; you cannot adequately express that pain. Pain is an essentially private affair, yet it is something experienced by all of us. Starting from these basic ideas, I'm hoping to find a better way to describe the catastrophe. By this I mean a totalizing concept of warfare, disaster, the battlefield—the things that define our era but which have become increasingly abstract, impersonalized, invisible, simulated and global. So how is the catastrophe popularly represented? Through terrorism. Terrorism is a gesture of advertising; it’s a literary act, a form of representation, before all else. 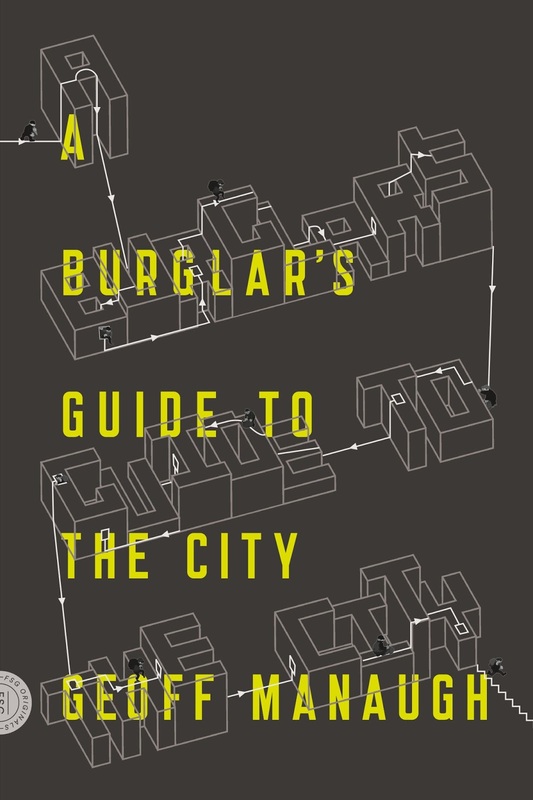 Its aim is not primarily to kill, but to capture the popular imagination through killing. It’s for this reason that I’m drawn to the air disaster: there is no finer, more succinct, more international, and more culturally loaded expression of the catastrophe than a plane crash. An airliner in vertical descent is a spectacle of modernity's complete failure. It is horrifying, but also aesthetically powerful—and it's for these reasons that terrorists covet the air disaster. I feel that photographers, who work in close proximity to advertising, can enter the terrorist’s symbolic order and violate the same taboos. Like the catastrophe, the air disaster is virtually impossible to represent. After the Continental crash near Buffalo last year, I traveled immediately to the site. It was totally inaccessible. In only a few hours, various authorities had come together to form a kind of firewall around the event; it had become opaque with layers of jurisdiction. [Image: "727 Santa Domingo" by Richard Mosse]. BLDGBLOG: How did you manage to get near the wreckage? Mosse: The plane had crashed into a suburban neighborhood, and state troopers were waving down the traffic about a mile or so from the site. I parked up in the woods nearby, slung my camera and tripod in a shoulder bag, and trespassed through people’s backyards in the hope of being taken for a resident. I was able to walk almost to the crash site itself, about 100 yards from the wreckage, where I stood and watched the disaster bureaucracy arrange and rearrange itself while body bags were carried out. Unable to get any closer than that, and with no clear line of sight, I looked for some trace of the disaster violating this residential idyll and found police tape slung around trees whose branches had been broken by the crash. I set up the tripod and within about twelve seconds the veil had closed in. First came the local officers, and then the Feds. They kept me there for about an hour, ran my name and social security number, and threatened me with arrest. I began to understand this larger project as a kind of deferral: I started to look sideways at the air disaster through older wrecks, forgotten relics in the middle of nowhere. There are layers of deferral here which attempt to access a crystallization of themes surrounding the air disaster. Control. Remoteness. Archaeology. Time. Environment. Form. Scale. Quest. The hidden. Taboo. In making these images, I'm aiming towards something aligned in spirit with Caspar David Friedrich's painting, Das Eismeer: spatial remoteness becomes temporal remoteness, and the forgotten plane wreck is swallowed by the primeval landscape. [Image: Das Eismeer (1823-24) by Caspar David Friedrich]. 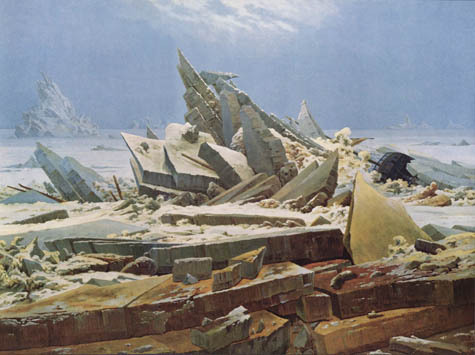 BLDGBLOG: Friedrich's Arctic shipwreck brings to mind a pretty incredible video that you've put together, called Leviathan. 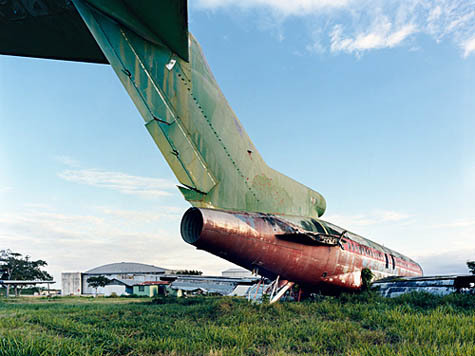 It features wrecked airplanes emerging from, or being dropped into, the sea. Can you tell me more about that project? Mosse: I met an extraordinary Dutchman out in Thailand who is known in wreck-chasing circles as the Dakota Hunter. 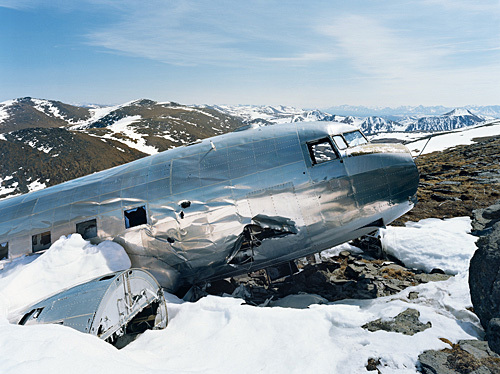 Once an advertising director for a cigarette company, the Dakota Hunter ventures into the world's remotest places to salvage the wingtips of C-47 Dakotas, which he then ships back to the Netherlands to be sandblasted and turned into luxury tables for boardrooms and executive offices. He very generously tipped me off about a Thai-organized project sinking Dakota aircraft into the waves off Phuket. These aircraft were vintage American military bombers (and Sikorsky attack helicopters) from the Vietnam War that had been donated to the Thai Army upon America's withdrawal from Saigon. They had been flown by the Thai Air Force until they could fly no longer, and have since lain rusting in the jungle. But the diving clubs of Phuket, struggling to re-stimulate the dive-tourism industry as well as the coral reef environment that had been virtually wiped out by the recent tsunami, came up with the idea of sinking these decommissioned aircraft onto the ocean floor. I pulled this footage from Thailand together with a second video showing the 2009 US Airways crash in the Hudson River. In this piece, I became fascinated by themes of tourism, disaster, globalization, the military-industrial complex, and history. But most of all, I'm drawn to the aesthetic power of the air disaster, and the majesty of watching airplanes be submerged and re-emerge from water, like a kind of baptismal rite. The sea has a wide array of psychoanalytic and mythic associations which I feel produce sparks of meaning when they coincide with the airplane's modern form. You can watch an unfinished version of the film below. This was shot and edited by Trevor Tweeten, with coloring and post-production by Jerome Thelia, and sound by Martin Clarke. Please note that this piece is not yet finished; it's just an early draft. BLDGBLOG: You're not a pilot yourself, meanwhile, so getting to these sites must have required a tremendous amount of assistance. Can you tell me a bit more about the people who helped you visit—like the Dutchman in Thailand—and the process you had to go through to get to these places? Mosse: I actually had to abandon one trip to see a wreck in a high mountain pass because of bear-paw prints in the snow! On my return trip, I brought a local fellow with a shotgun. I asked him whether he’d ever had an encounter with a bear, but he wouldn’t tell me, saying that he’d give me an answer after we reached the wreck and were making our way back down the mountain. Once I’d finished making the photograph and we’d started for home, I asked impatiently for an answer. He told a fabulous story of being charged by a five hundred pound grizzly who picked him up in her jaws and flung him like a ragdoll. Lucky for him, he managed to fire a shot at the bear while it was coming at him, saving his life. He showed me the wounds on his shoulder and forearm. That trip was by all-terrain vehicle—with a few hours of heavy walking through snow—but, on other forays, I’ve hired a helicopter. I had a choice of pilots in a town in the Yukon, and decided to go with the Swiss pilot, thinking he’d be safer. But he totally failed to find the wreck and flew me to the top of a mountain range where we sallied out into the snow to frown at the horizon. I made a second attempt the same day with a different pilot, one who had lived there all his life. He took me straight to the wreck and suggested many others. Always shop local. 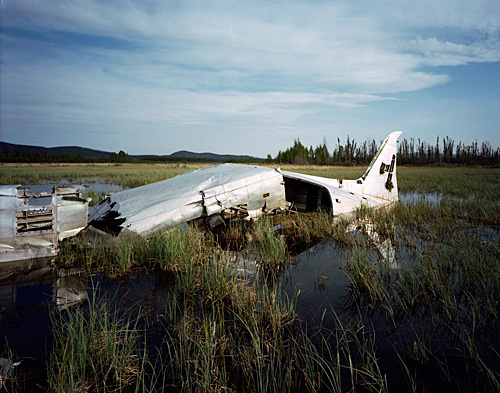 Another pilot dropped me into a swamp, way out in the Yukon wilderness. He left me there alone and flew off to refuel. I had to wade up to my armpits in the swampy water for hours, apprehensive that the helicopter would never return. But my fears were forgotten when I discovered that an animal, perhaps an otter or a mink, had built a nest out of reeds in the shelter of the belly of the plane wreck, and birds had propped their nests in holes in the back fin. [Images: (top) "C-47 Beaver Creek" and (bottom) "C-47 Snag" by Richard Mosse]. 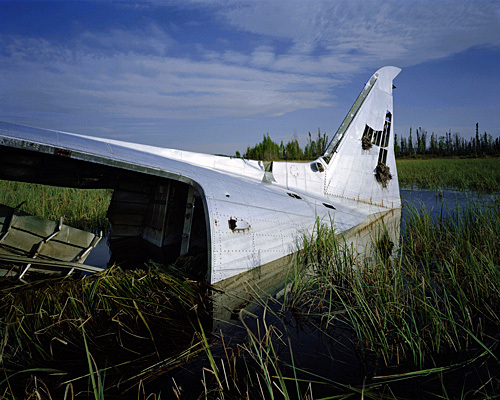 BLDGBLOG: What about particularly unexpected or surreal plane wrecks? Mosse: The tail of an old Nazi Junkers was discovered while dredging a lake in northern Finland. I suppose nobody knew what to do with it, because it was simply dumped in the car park of a supermarket, in the same sort of place that joyriders might abandon a burned out car. I like to imagine the local people driving carefully around the old Nazi tailfin, and it becoming a well-known attraction in the region. There’s also a crashed Cold War bomber that has been salvaged from the Icelandic wastes and is now used as a garden shed. And, in Sicily, the remains of an Alitalia disaster were propped proudly on the roof of a scrap merchant’s shed. Sadly, this monument no longer survives. But scrappers are not always the plane wreck’s enemy. At 13,000 feet in the Patagonian Andes, there’s an old Curtiss Commando which has been neatly cannibalized leaving only the cockpit. In the winter, flamingoes migrate to this freezing and inhospitable salt lake in northwest Argentina to mate. 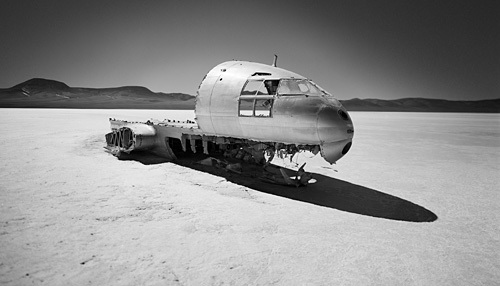 [Image: "Curtiss Commando Patagonia" by Richard Mosse]. BLDGBLOG: When Steve Fossett, the aviator, disappeared over Nevada last year, there was a huge technological effort to find his plane again—people using Google Earth from all over the world, for instance, to spot the wreckage. It became a kind of landscape challenge. Did the enormous response to that air disaster, or even the public's use of satellite surveillance technology, have any influence on your project? I’m intrigued by the idea of people logging into, and staring at, live webcam views of an unchanging landscape on their home computers. What drives people to do this? I suppose it's the same lure that draws people to Google Earth. These are both a pursuit of the real within—and through—simulacra, and you are apprehending the world as if it were a computer game. That is enormously empowering, because the tools at your disposal are extremely powerful. You can go virtually anywhere without putting yourself at risk. But, ultimately, it’s a form of entertainment: you’re consuming a representation of the world—one that’s been produced—and not representing the world for yourself. [Images: "Miss Piggy Churchill" 1 and 2 by Richard Mosse]. BLDGBLOG: In J.G. Ballard’s fiction, there is often a character who is a wounded aviator—someone who’s been in a minor plane crash or car accident, has a ruined knee, and can never fly again. They are exiled on the earth, so to speak. Ballard sometimes included lost aviators in his fiction: amateur pilots who have taken on the air of Arthurian knights flying pioneer missions into the skies of undiscovered worlds. 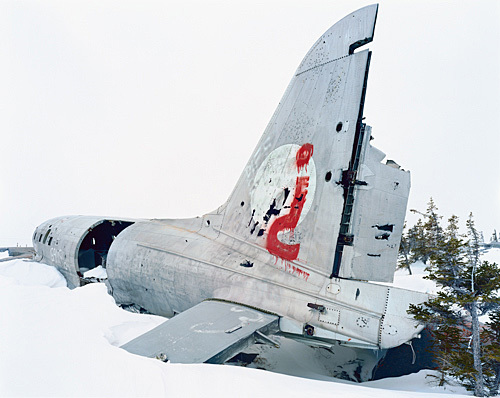 Does this romance or mythology of the figure of the pilot—not the airplane—have any role in your interest in photographing crash sites? There's even someone like Amelia Earhart, whose disappearance only amplified her already global fame. Mosse: Certainly. Since I was a boy, I’ve been haunted by Ballard’s story of a journalist visiting the site of an air disaster in the Mexican mountains. But I’m also thinking along the lines of Robert Smithson or Bas Jan Ader: the artist heading out to his death in the wilderness, like the protagonist at the end of Jim Jarmusch’s Dead Man, whose body disappears into a ghostly fog on a drifting boat. [Image: From Fata Morgana, directed by Werner Herzog]. BLDGBLOG: Finally, is there a crash site that you really want to get to but either haven’t had the time to visit or the wreck might even just be a rumor, an urban legend? 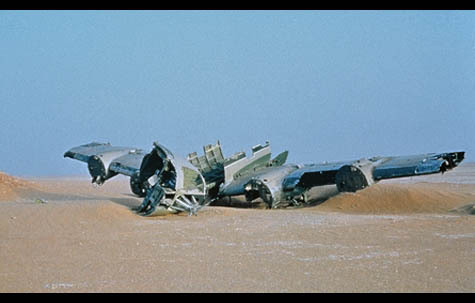 Mosse: That would have to be the plane wreck in Werner Herzog's Fata Morgana. It was like an epiphany for me when Herzog’s lens comes across this ruin in the Saharan desert; he examines the twisted form as if it were a sculpture in the landscape, like the Sphinx. I immediately pressed rewind and watched the scene again and again, swearing to myself that I would retrace his journey south through Algeria to search for the ruin. But it’s impossible to find. Be sure to read BLDGBLOG's earlier interview with Richard Mosse: Saddam's Palaces. Mosse's solo exhibition The Fall closes on 23 December 2009. Hauntingly beautiful images that certainly stimulate the mind, and his other works are just as powerful on his website! Really fascinating stuff! I've heard that there are quite a few downed WWII planes in the peatland bogs in Northwestern England, I had been meaning to go trudge out to them for a while. Now I'm re-inspired. What an amazing post... thank you very much. Wonderful interview with equally great Photographs. And thanks for reminding me of CDF's Eismeer. Saw the real thing once and somehow feel attached to it since. Awesome stuff. I worked near a site where a B-24 crashed in the woods in the Rockies. It was fascinating to see how the plane had sprawled out over the slope. 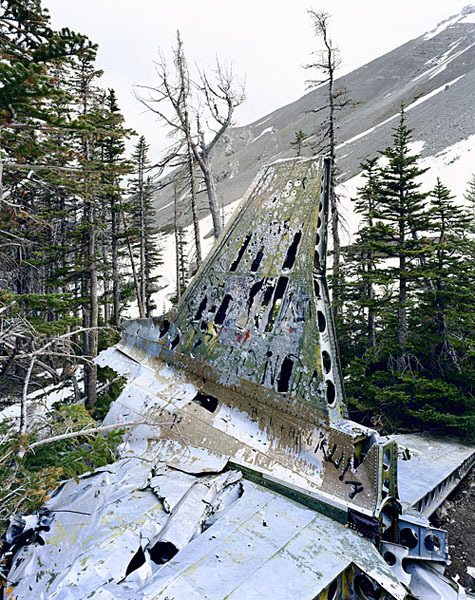 The tail was intact hundreds of feet away, while the wings and fuselage were more deteriorated and rested at a much higher altitude, with a trail of metal bits spread out in between. The most interesting thing about it was how perfectly intact sections of the plane were juxtaposed with violently dismembered parts, and what looked like the remnants of a few hundred tin cans. Wow! Some amazing imagery and fascinating interview here, thanks for posting! I've got a book called Peak District Aircraft Wrecks (more info here: http://www.peakdistrictaircrashes.co.uk)which details walks to find crashed aircraft in this area of the UK. One of the most interesting is a B-29 Superfortress called "Over Exposed", which was the back-up bomber for the Hiroshima raid. It flew on the mission, although wasn't required to drop its bomb. It crashed just after the war on a routine flight due to bad weather. There's a fair bit still remaining, including the engines. I also read about fighter planes crashing deep in the mountains of the Nevada Desert, and never being recovered due to their remoteness or lack of public access. In some cases some haven't been found, although that could be a myth. Great article! Very, very small point; the salt lake at 13,000 feet in northwest Argentina is not situated in Patagonia, which, is farther south, starting around the 42nd parallel. Excellent photographs, and some interesting comentary, but overall I was left with the impresion that Mosse has ideas and attitudes that I do not share. His gloating over the 'failure of modernity' for example. None of his work would be achievable or accesible to anyone in the supposed Golden Age when the height of art for the common herd was poking a turnip with a sharp stick.